[Update] 8 October 2014. 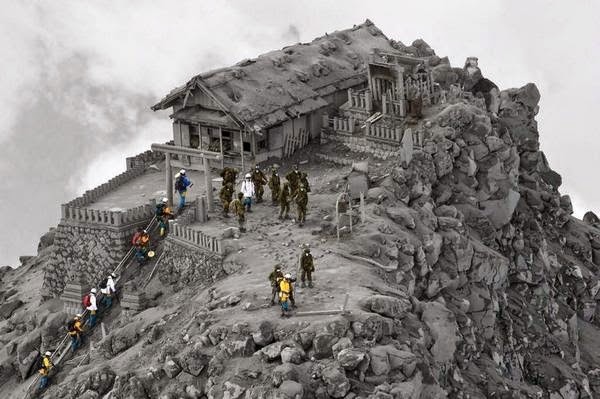 More than ten days after the sudden eruption of Ontake it's now known that over fifty people lost their lives and a number still remain missing. The threat of further activity, gas clouds and typhoon Phanfone has curtailed the recovery efforts but the teams continue to search for those believed to remain near the summit. It was a beautiful autumn day and people were simply out enjoying the view. Current reports suggest that the type of explosion was steam rather than magma driven and therefore hard to detect given the current monitoring systems. The ash is deep and the rocks so large many are immovable. But the recovery teams continue their efforts. [Update] 36 hours after the start of the disaster things are now looking significantly worse. Over 250 are reported to have been on the mountain when it erupted and at least thirty may have lost their lives. Question is, why were people allowed up there in the first place? I'll try and answer this as it becomes clearer, in the meantime let's hope the people remaining there come down safely along with the emergency crews. Japan is an island of earthquakes, fault lines and volcanoes. And four hours ago at 11.55 today one of the volcanoes awoke. Normally it would be possible to forecast eruptions through seismic activity in the area. Indeed a few years ago I was "advised" to leave the area of Asamayama and the following day it let us know it wasn't pleased and deposited ash on Tokyo, some 200k's distant. Mt Ontake appears to have taken people by surprise this time though. The first reports and video being relayed by hikers actually on the mountain. Thankfully no reports of fatalities as yet. The volcano itself is some 200k's west of Tokyo so it's unlikely there will be any impact here but the local area is being blanketed in some 30cm of ash with more on it's way. The ash weighs on buildings and brings the risk of collapse and is also statically charged which can short power systems and add to the difficulty of rescue. Ontake is in a relatively rural area but the real concern is if Fuji erupted. The mountain is in a relatively populated area and is approximately 100k's from Tokyo. This would cut Japan in half, severing the main transport routes between Tokyo and the west of the country.